Some materials will not show until rendered. 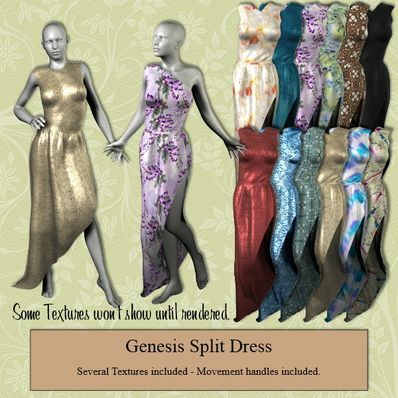 Several textures for the Dress. Also presets to hide/show left shoulder. Very stylish. Now I suppose I'll "have" to do a party scene to show it off! Great work, thank you for sharing! Love that we have the choice of hiding the left shoulder. Just marvelous!! TKU! These textures are awesome! Thank you! Beautiful! I can't wait to try it out!